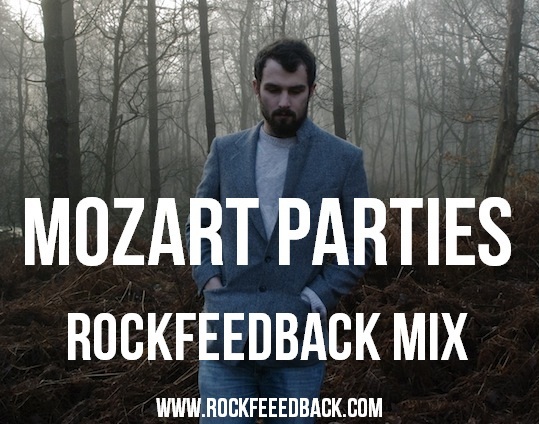 "We're proud to present the exclusive Mozart Parties mixtape, featuring some of Bennett's favourite artists delicately pulled together to make for a truly wonderful listen". Mozart Parties is the solo project of James Bennett. Born and raised on the suburbs of London, he spent three years studying music in Leeds, before relocating to the small, remote village of Kirkby Lonsdale in the Lake District in early 2009. The wilderness, nature and isolation of the new surroundings introduced a textural, atmospheric element to his long standing love of pop music. In this new, secluded environment he began making music under the name 'Mozart Parties', writing and recording brilliant pop songs of lush arrangements and infectious melodies, coupled with cleverly discerning, introspective lyrics. Alongside realizing his home-spun musical vision as a full fledged live band, practicing in a country barn (underneath a tractor and a herd of sheep) Bennett released his debut single,"Black Cloud", on Merok records to a brilliant reception. The single was shortly followed by the equally acclaimed online Memory Thunderstorm EP towards the end of the year, with 2012 promising to be an even more exciting year for Mozart Parties. With that in mind we're proud to present the Mozart Parties mixtape, featuring some of Bennett's favourite artists delicately pulled together to make for a truly wonderful listen. The tape mix ties in with our upcoming New Ideas show, which the band are set to headline with support from the genius Sylver Tongue and very exciting Amusement. Stream/download the mix via the soundcloud player below.